Belmont Party Supply was the original home of BrewTensils. How are you enjoying Dayton Beer Week so far? The wide variety of beers, beer dinners, and other special events should be heaven for any beer lover in the area. Some people are not satisfied with just going out and enjoying. Some people need to create it on their own. For those people, there is BrewTensils. They have been open for just a few years, but have a much longer history than that. Darren Link, the manager at BrewTensils, took some valuable time out of his schedule to answer a few questions for us here at Dayton Most Metro. He spoke a little about the growing Dayton craft beer scene, how he started home brewing, and how you can join the ranks of home brewers in the area. How did you get into home brewing? How long have you been doing it? I got into it the same way almost everybody else does, a friend said “Let’s make some beer.” And I had the typical reaction “You can do that?” We made a few awful batches, I ‘borrowed’ some of his equipment to do my own beers. I got the bug and have been doing it for 4 years now. I kind of jump around with the styles I brew, so I don’t think I have a favorite style to brew. I enjoy brewing IPA’s; you will never have a fresher IPA than one you brew yourself. I also enjoy brewing English styles, Belgian Sours, and recently finished my second lager a Munich Dunkel. 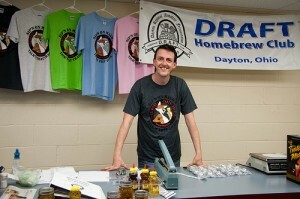 What made it a good time in Dayton to open a home brewing store? 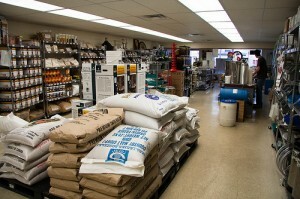 We have sold homebrewing supplies for the past 25+ years. The supplies used to be in the back of the beer store next door, Belmont Party Supply. A small shelf and items were constantly out of stock. Both BrewTensils & Belmont Party Supply are owned by Mike Schwartz. He noticed the demand increasing in the area and after the dry cleaner went out of business that used to occupy this space, established the current BrewTensils roughly 3 years ago. We’ve been consistently growing ever since. How have you seen tastes in beers change? There’s almost an evolution in craft beer drinkers tastes. They have one craft beer or a couple beers that change their prospective. They get curious about what else is out there; they typically get into IPA’s and the hoppier styles. Then higher gravity (higher alcohol) and finally start appreciating the styles that are difficult to brew. As far a craft in general, it’s up 14% this year when beer sales in general have declined. Do you see home brewers influencing national trends, or vice versa? I think it’s a two way street. Brewers like to see how close they can get to brewing their favorite commercial beers. There are literally millions of clone recipes on the internet; New Belgium Fat Tire, Bell’s Two Hearted, and Great Lakes Edmund Fitzgerald being very popular ones. On the other side of it, homebrewers have helped to save some less popular beer styles. I feel that traditional Belgian Lambics have been an example. Almost going extinct in Belgium in the 60’s & 70’s, the popularity amongst homebrewers, professional brewers & beer connoisseurs have helped to keep them alive. IPAs look like they are all the rage right now. What do you think the next beer trend is going to be? I think IPA’s will always be the rage. I think session beers are increasing in popularity. A session beer being defined as a beer you can drink large quantities of without getting sloshed and typically has an alcohol percentage between 4 & 5.6 or lower. People want to try several different beers in one sitting, maybe even venturing outside of their comfort zone. On the other side of that there’s ‘extreme’ beers which can clock in at 10, 12 even 18 or 20 percent, which you can have one of and be rocked. When does your next round of classes start? What do you like most about teaching them? I don’t have dates set for those yet but I’m looking at having a round of classes before the holidays, so October/ November time frame. Our largest attended class is right after the holidays in January. The past 2 years we’ve had 70 people attend Brewing 101. I like seeing their excitement of getting started, getting hooked and then bringing their first or second beer in for me to taste to see what I think of it. Kind of living vicariously through my customers reminding me of how excited I was when I started. -best beer you have tasted brewed by one of your customers? The one that’s in front of me. No seriously, I am always pleasantly surprised by the high quality of beers that my customers brew. There’s an ancient beer style that used a whole uncooked chicken thrown into the fermenter. He soaked the entire chicken in white wine to ‘sanitize’ it, put it in the secondary for about 2 weeks, and loosely filtered it. I thought I was going to get salmonella from drinking it but the white wine added more character than the chicken. -a beer you thought sounded awful but ended up tasting really good? It didn’t sound awful; I was more intrigued by the idea of using homegrown garden herbs and spices in a beer. I have a couple of those I’ve done with great success. Honey basil ale is a really popular summer seasonal. Several customers have brewed it also with rave reviews. Another one that came out well is Thai basil & lemongrass wheat. But not all experimentation beers have turned out well, I’m still trying to perfect a baklava inspired beer with honey, pistachios, and philo dough. Dayton Beer Company just opened, and Toxic Brew Company, Fifth Street Brewpub, Vitruvian Brew, Yellow Springs Brewery and Dayton History are poised to open breweries in the near future. Plenty of restaurants already have a wide selection of craft beers in the area, like Boston’s, South Park Tavern, Chappy’s, and a few others. Do you think Dayton is close to a saturation point on breweries and craft beer? Not even close, we’ve only just begun. I had a theory before the new resurgence of breweries. I think Dayton was the largest craft thirsty market in the US that didn’t have an operating brewery. Look at the numbers Fifth Street Brewpub got for their charter member drive. Their original goal was 300 they got 830, in one month. I feel that Dayton and surrounding areas could support a double digit number of breweries. Grand Rapids, Michigan and Ashville, North Carolina split the Beer City USA title this year. Those aren’t huge markets but beer tourism drives some of that. Don’t be surprised to see some beer tourism in Dayton a couple years from now. What is your advice to someone that wants to start brewing? What is a good “beginning style” to start with? Belmont Party Supply, BrewTensils, and Stacker’s Subs and Grub are all located on Smithville Road, near Watervliet Avenue. You can call BrewTensils at (937) 252-4724, and become their fan on Facebook. Cheers!